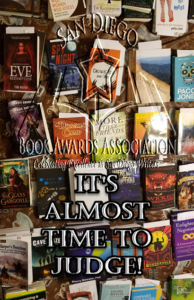 Calling all Published and Unpublished Entries for the 2019 San Diego Book Awards! The San Diego Book Awards competition is open to current residents of San Diego County. Books submitted for the 2018 competition (awards presented in June 2019) must have been first published or copyrighted in 2018. BE ADVISED — For published entrants, 2017 and 2018 release dates are included. Open to all writers residing in San Diego County. Winners will be determined by a panel of judges. CASH AWARDS for Published Entries! Unpublished/Published entries from 2015* and 2016 are both eligible. *Due to the installation of a new Board of Directors in 2016, unpublished and published books with a 2015 copyright or publication date will be eligible. Only one winner will be awarded in each genre. Entry deadlines will be firmly adhered to so please read carefully.